At least, at my house this weekend, it did! There are, after all, only so many tomato salads you can eat without getting burnout. I’m not thrilled with canning in this heat, and while it may seem that having the oven on in the heat is the same as canning, let me say that an oven at 250 degrees is not as bad as bending over a hot, boiling pot of tomatoes and canning water. Fresh tomatoes, still warm from the sun. Picked 8/25/13. I looked for recipes online, but a lot of them seemed like a lot of work. Well, okay – they called for scraping out seeds and pulp, leaving just the rind and the flesh attached. I like my dried tomatoes with heft, and I didn’t want to do the scraping. So I kept looking for a recipe that would suit me. The sun-dried tomato recipe looked interesting, but I didn’t have screens I could use, didn’t want to worry about bugs, and didn’t want to be drying tomatoes all week. I had just the weekend. Martha Stewart to the Rescue! So, I picked tomatoes, washed them, dried them, cut them in half (large cherry tomatoes, mostly, and then lots of tiny cherry tomatoes). 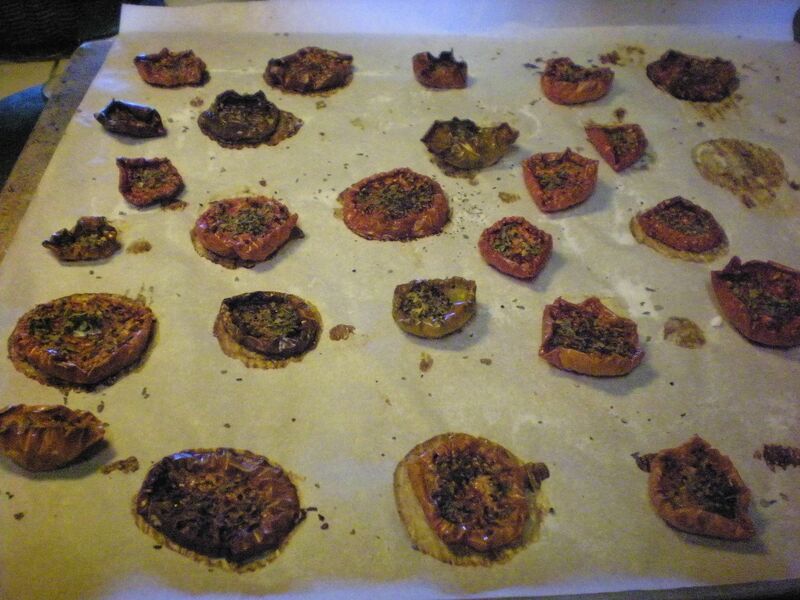 Then I sprinkled sugar, dried basil, pepper and salt over them, popped them in the oven, and let them do their drying-out thing. Ready for the oven! These are the bigger tomatoes, not the cherry tomatoes. Pretty, aren’t they? As the afternoon went on, my house started smelling like yummy, professionally-made tomato soup. Rich and meaty and tomatoey – oh my! Totally delightful. After several hours – 5 or 6, I don’t remember – I took the trays out. They were browned on the edges, but ooh – tasted like a blast of tomato in the mouth and a little crunchy. Totally addicting. I believe the hubs ate a full quarter of the smaller cherry tomatoes that I’d done. 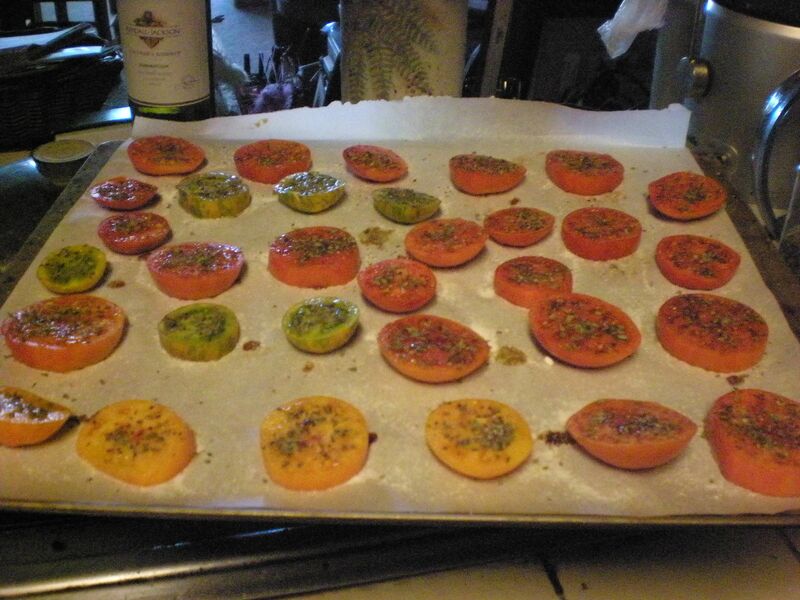 Not as pretty afterwards…I decided I’ll never dry the bright green tomatoes again. Red is so much prettier! These are sliced, by the way, not halved. I did two – or heck, maybe three? – batches yesterday, and I’ve done one batch so far today (with the other batch still in the oven). I’ve got four jars of tomatoes put up, with more to come. And LOTS more tomatoes still on the vine! Baby tomatoes in pint jar, waiting for its fellows. Considering how expensive sun-dried tomatoes are in the store, I think I know what I’ll be doing every summer that we grow tomatoes. On one of the sites I checked on yesterday (I think it was the Martha site, not sure) a commenter said they let the tomatoes cool, then froze them on the tray singly before putting the frozen tomatoes in a zip lock baggie. She said they were great to use in stews and sauces (plus you don’t get the oily taste if that’s not what you want). But the hubs wanted that olive oil. I used a Mediterranean mixed olive oil that’s available at Costco – we buy it by the gallon I think, so I have a lot of it, and it’s not super expensive. But I’m willing to bet that after several months, the oil will taste divine, with tomato, pepper, and basil flavors. A terrific base for a salad dressing. My jars of tomatoes. I’ll be getting two more jars done tonight before I sleep. But now, after so many dried tomatoes, I feel the need for something fresh. Like a tomato tart. So as the sun goes down, I’m off to the store for some puff pastry – because that’s something I doubt I’ll ever have the patience to make at home. 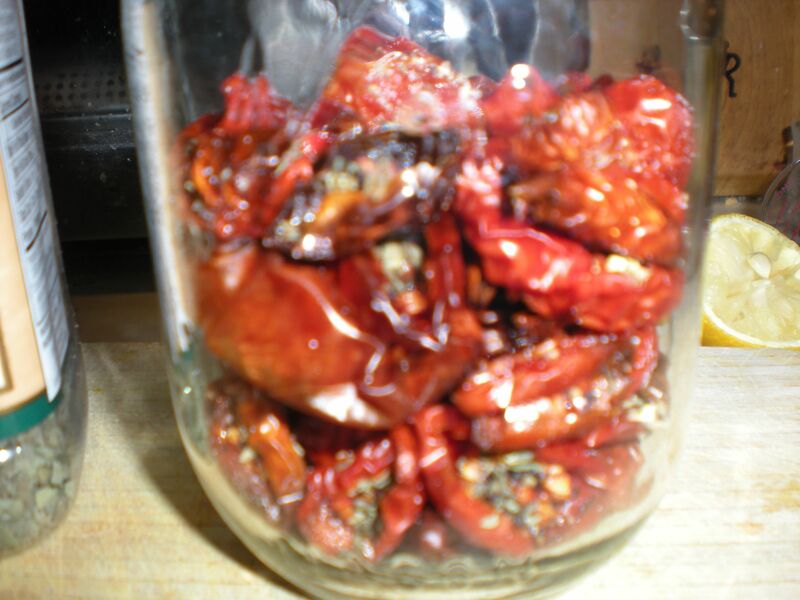 Do you like sun-dried tomatoes? Have you ever made your own? 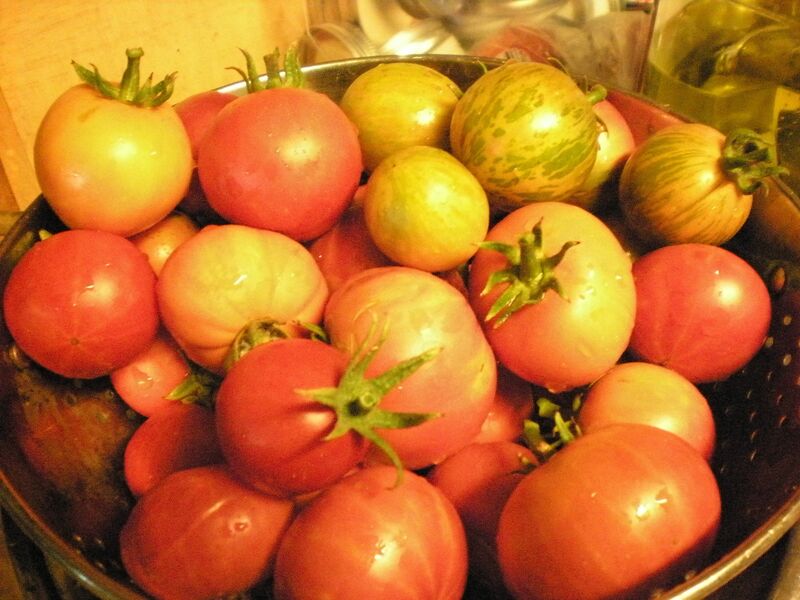 What is the most yummy thing you have ever made with tomatoes? Until next time, cheers – and be good to one another! 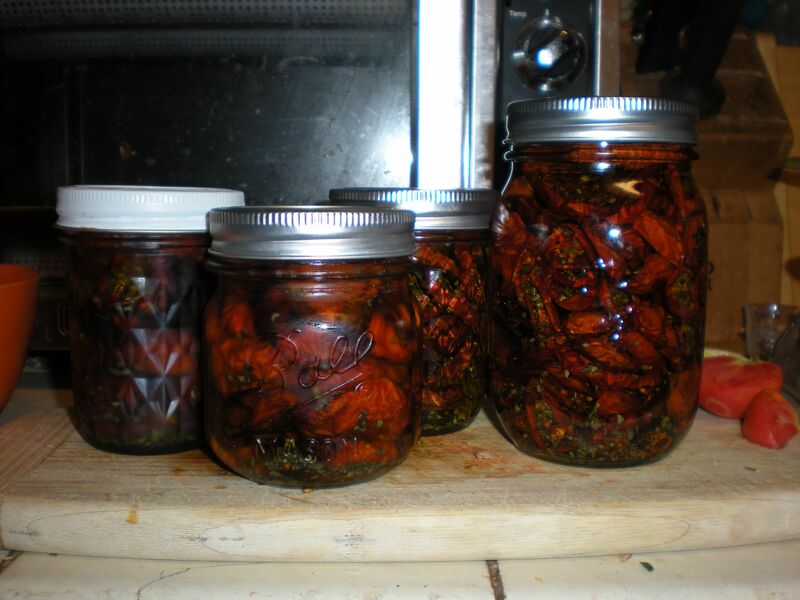 This entry was posted in Cooking and tagged Christine Ashworth, dried tomatoes, home made dried tomatoes, Martha Stewart, oven dried tomatoes. Bookmark the permalink. My granddaughter eats tomatoes like apples. She would love to come visit you! We’ve had the weirdest summer ever, so our tomatoes are JUST NOW coming in. We have about four dozen on the vine–five plants–in everything from dime-sized to fist-sized. Only one has ripened enough to eat, and we shared it three ways last night (my dd is home for the week). So, we’re truly jealous of you right now. But I can empathize. Besides linger cold temps early on that made things like tomatoes and potatoes slow down, we’ve probably had the wettest summer on record. So, since we don’t plant squash until the end of May, none of the cold temps slowed it down. But all the rain has made the plants produce like they are on steroids. We usually have just enough yellow squash to keep my husband and I happily eating all summer, and feeding a few friends when we feel a little largess. Instead, even though we planted one less plant than we usually do, we’ve easily had seven times our usual harvest, I never thought I could ever get sick of yellow squash–it truly is one of my favorites–but I can honestly say I don’t want any more. I’ve given it to everyone I know who will eat the stuff, and I still have a crisper full. I don’t like to freeze because I have to do all the blanching work–I know, it’s not that hard, but I convince myself I have better things to do. But if our tomatoes come in even half as great as yours, I will definitely be doing the “drying and put in a jar with olive oil” fun you’ve been doing this weekend. I can see great quick Christmas gifts, too–pull out a bottle, put on a bow, make someone very happy. Yes, Joanie! That’s what I was thinking. I need to dry more, though, because the hubs is in love with them. We’re having them on pizza tonight! I’ll be honest and say I’m not crazy about sundried tomatoes. 🙁 sorry. But maybe because the ones I’ve tried are too oily? I’d love to get on a list for some of your green tomatoes as I’m dying to make my version of fried (I’ll bake them?) green tomatoes sometime! Also, a taste for something I picked up in England – grilled half tomatoes with breakfast – is yummy too. But I know what you mean, there are only so many tomatoes a person can eat. Good for you for being proactive and putting those wonderful tomatoes to good (future) use! I like them this way: cut tomatoes in half, sprinkle with parmesan cheese and ground black pepper, a tiny dot of butter in the middle, and yum. I often do this with my grilled zucchini and have it for dinner. YUM! Roben, I’m definitely trying this at home tonight! LOL Sam! I cook much more now that my kids are older. And hey – any time you want to bring the fam over for dinner, let me know! Hugs! What an inspiration!! Still time for farmers’ market tomatoes!! already have parchment paper, jars, oil, basil on hand! Perfect for post-surgery recovery project- esp since I’ve got to ‘lay low’ and rest over the weekend! Thanks, Christine!! You’re right, it is the perfect post-surgery type of occupation. I ran out of parchment paper – had that roll for years and when I truly needed it, zappo. Gone. Used the same three sheets for 9 loads of tomatoes. Didn’t seem to hurt anything, lol! Enjoy, my dear – and let me know if you use anything other than basil. It looks really yummy. I wish I could have tomatoes but they set my gut on fire. I miss my BLT’s. Enjoy your fruits of labor.